Last weekend, my youngest daughter and I walked to the local branch of the public library. It was a good bit of exercise, and we had some books that we needed to return. We decided to look around for a book to read, and both of us liked the look of a new one called Story of the Titanic by Steve Noon. With the centennial of the ship’s sinking, and the re-release of the film by James Cameron in 3-D, there’s certainly no lack of interest in this subject. As we paged through the book together–which is very well done, I have to say–I found myself looking for information about an unknown, yet significant casualty of the terrible events of April, 1912. Finding none, I decided to take matters into my own hands in this space. If you’ve ever heard of Homer C. Davenport before, please accept my apologies. But if not, please read on. You might learn something worthwhile if you do. Homer Davenport was a cartoonist by trade. He was originally from Silverton, Oregon, but he made his way to San Francisco and then on to New York City. He was hired by William Randolph Hearst, and his drawings were biting social commentary on the news and personalities of the day. In addition to cartooning, Davenport had an interest in Arabian horses. He traveled to Arabia, and, with the permission of the sultan, brought back a group of 27 horses, the pure-bred descendants of which are still called Davenport Arabian Horses. What a legacy that must be, to have something named after you, a hundred years and more after the fact. Few of us–if any–will have something comparable to that in our lifetimes. Homer Davenport was also a friend of Albert G. Spalding, a sporting goods manufacturer and a key figure in the development of baseball (or “base ball” as he called it). I alluded to Spalding in a previous post, and pointed out how a century’s worth of baseballs all carried his name on them. When Spalding was getting toward the end of his life, he had his friend Davenport come out to his home in California, for the purpose of drawing illustrations for Spalding’s memoirs. 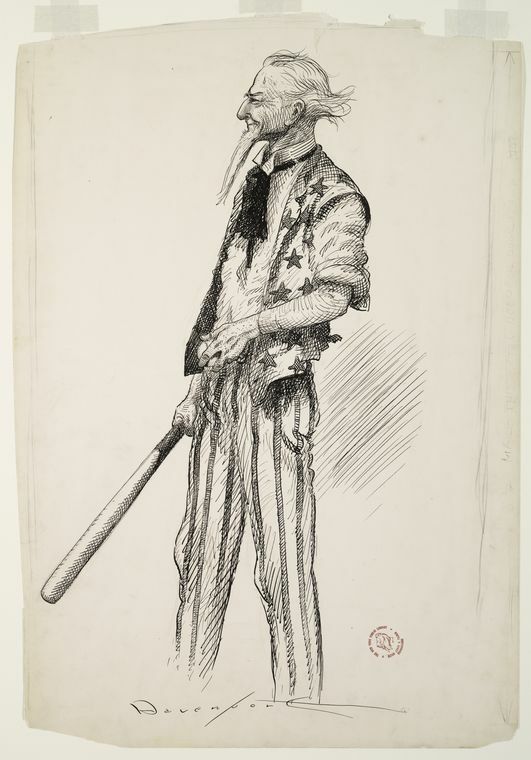 Davenport’s Uncle Sam, depicted as holding a baseball and a baseball bat, appeared previously in this space. 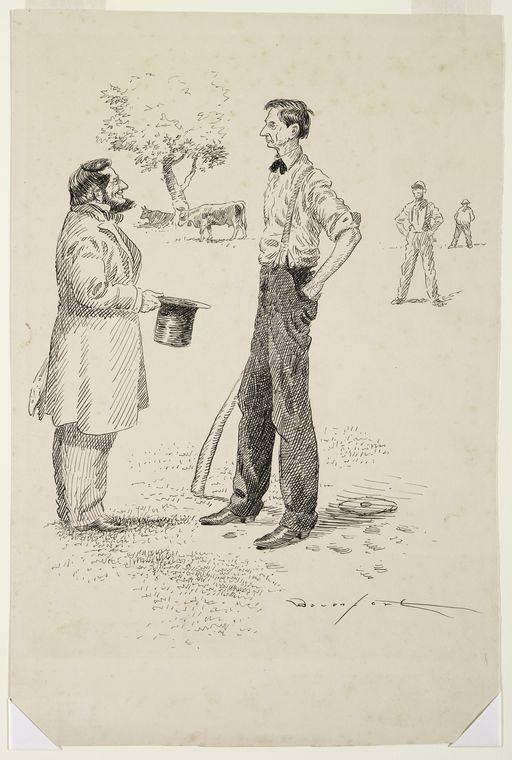 Davenport’s drawing above depicts a scene where Abraham Lincoln plays a baseball game while learning of his nomination for president in 1860. My love for all things Lincoln has been well-documented in this space, while Davenport’s other drawings for Spalding are available here. 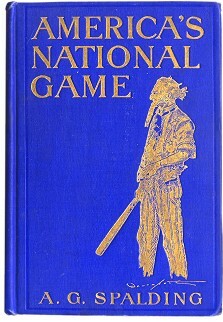 Since Spalding’s book was published in 1912, it’s fair to assume that Davenport’s cartoons were drawn sometime in 1910 or 1911. Davenport was in his mid-40s at the time, with presumably many more years of social commentary ahead of him. But as Davenport was drawing away for Spalding out in California, events were unfolding in an Irish shipyard that would indirectly seal his fate. When Titanic hit the iceberg and sank on the night of April 14, 1912, there were conflicting reports of what the casualties were. People were understandably desperate to find out whether their loved ones were all right, but nobody knew what the story was regarding survivors. The result was that 80,000 people were at the harbor in New York awaiting the arrival of Carpathia, the only ship that carried Titanic‘s survivors. If your loved ones survived the catastrophe, they were aboard Carpathia. If not, well, there wasn’t much else to be said. Hearst understood that the story of Carpathia‘s return would sell lots of newspapers. There would be agony and grief, with perhaps some joy and celebration thrown in, too. Hearst sent Davenport to the port to witness the arrival, and then filter the events through his own creative lens. No photographs could ever do the scene justice, but perhaps Davenport could capture it for the world to consume–after buying a newspaper, of course. But it was a cold night in mid-April, and the exact time of Carpathia‘s arrival was unclear, as was most of what was reported about Titanic’s fate. So the people waited, Davenport included. And by the time Carpathia arrived at 8:00 in the evening, Davenport had contracted the pneumonia that would end his life on May 2, one hundred years ago today. The inquiry into the sinking of Titanic put the official number of fatalities at 1,517. The book that my daughter and I read at the library broke the numbers down by first, second, and third class passengers, as well as crew members. Since Davenport was not on the boat, and did not meet his fate in the icy North Atlantic, he was not counted among that number. However, the sinking of the ship led to his demise, since without it he would not have been exposed to the elements while waiting for Carpathia to arrive in New York. Davenport’s passing was reported at the time, but as Titanic‘s legend grew, Davenport’s name appears to have been lost in the shuffle. This is being written to remember Davenport’s life, as well as the circumstances of his death, and to bring some additional closure to the enormous catastrophe of a century ago. May all of its victims rest in peace.